The nitrogenous fertilizers market was valued at USD 110.55 billion in 2016. It is projected to grow at a CAGR of 2.33% from 2017, to reach 126.96 billion by 2022. Secondary research was conducted to obtain the value of nitrogenous fertilizers market for regions such as North America, Europe, Asia Pacific, South America, and RoW. 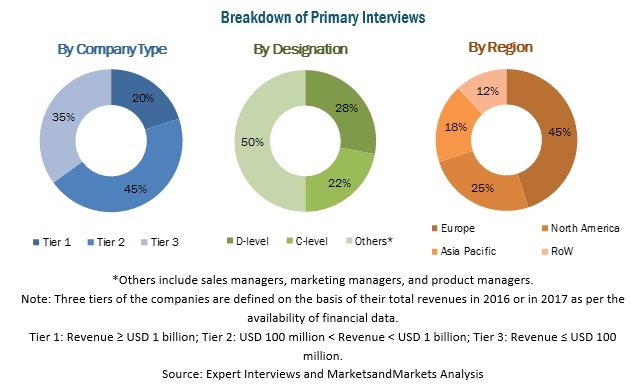 The research methodology includes the study of annual and financial reports of top market players as well as interviews with industry experts (such as CEOs, VPs, directors, and marketing executives) for key insights (both quantitative and qualitative) for the nitrogenous fertilizers market. The key players that have been profiled in this report include Yara International ASA (Norway), CF Industries Holdings (US), Nutrien [Agrium (Canada) and Potash Corp. of Saskatchewan (Canada)], and EuroChem Group AG (Switzerland). The nitrogenous fertilizers market is projected to grow at a CAGR of 2.33% from 2016, to reach a projected value of USD 126.96 billion by 2022. The growing need to increase the productivity, level yield, and fertilizer intensity gaps across regions, as well as increasing awareness regarding soil profile and nutritional balance backed by government support, are the major drivers for the market. On the basis of type of nitrogenous fertilizers, urea is most widely used in agriculture and has contributed to nearly 90% of the growth of the nitrogenous fertilizers market in the past decade. Urea is preferred as a substitute for ammonium nitrate and is used widely as farmers have identified it as an economical and easy to use an alternative. Ammonium nitrate is projected to grow at the fastest CAGR between 2016 and 2022, due to its increasing demand attributed to the rapid absorption features of the nitrate compounds by plants, with minimal loss of nutrients as compared to other nitrogen fertilizers. Nitrogen fertilizers have been witnessing traction in the market in the form of slow release and specialty fertilizers along with nitrogen stabilizers to reduce the excessive wastage of these fertilizers. Dry nitrogenous fertilizers are widely used as they are easily available and inexpensive as compared to the liquid nitrogenous fertilizers. In addition, farmers are becoming aware of the advantages of liquid nitrogenous fertilizers, which include their stability and enhanced efficiency for absorption by crops. This has led to an increase in the demand for liquid nitrogenous fertilizers. The Asia Pacific region accounted for the largest share of the total nitrogenous fertilizers market in 2015, due to the presence of several leading players producing nitrogenous fertilizers for various applications in the region. South America is expected to grow at the highest CAGR, due to the growing awareness about the advantages of other forms of nitrogenous fertilizers among farmers in the region. Farmers across the globe use some amount of synthetic or chemical fertilizers to boost productivity. However, the growing trend of preference for organic food that is produced without any synthetic or chemical components or is produced mainly with natural components or biofertilizers has been witnessed in recent years. This is due to growing health awareness, environment protection, food safety, and other related concerns and is made affordable by rising income levels. This, in turn, is projected to impact the nitrogenous fertilizers market during the forecast period. Over the past years, competition in the nitrogenous fertilizers market has intensified. Yara International ASA (Norway), CF Industries Holdings Inc. (US), Agrium Inc. (Canada), Potash Corp. of Saskatchewan Inc. (Canada), and EuroChem Group AG (Switzerland) are some of the major players dominating the market. 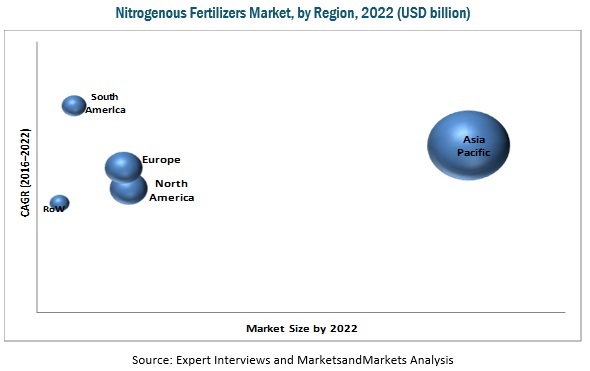 Growth in the market for nitrogenous fertilizers is largely driven by strategies such as expansions, acquisitions, and investments & divestments, which improved the product offerings and catered to the demand for nitrogenous fertilizers in various regions. Figure 56 Soil Types in the U.S.